My Brazilian embroidery table runner (supposedly) should've been completed by this time. But my plans have changed..
After my last post about being unhappy about the "look" , I received quite a few suggestions - and most of them asked me to add more flowers. A blog friend even mailed me a picture to give me an idea. Thank you all !! This was how it looked last month. My idea was to stitch four different bunch of flowers on either side with another few in the middle. Yes, it looked pathetic.. 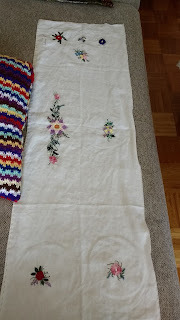 I have now added a border line with brown to connect the flowers. The border looked empty, so vines and fine growth were added. Some more new flowers joined the party. A Maria's rose. I tried this one with the Frost Edmar thread. Rolled roses. This one was a totally different color choice. 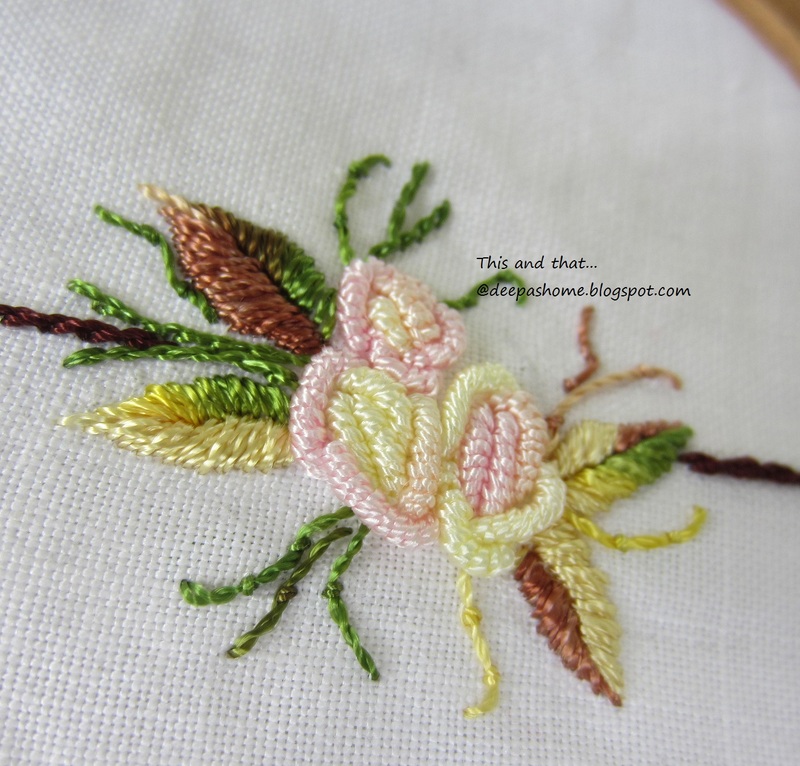 and finally a tiny Peach blossom using detached buttonhole stitch. There's still some more work to be done. 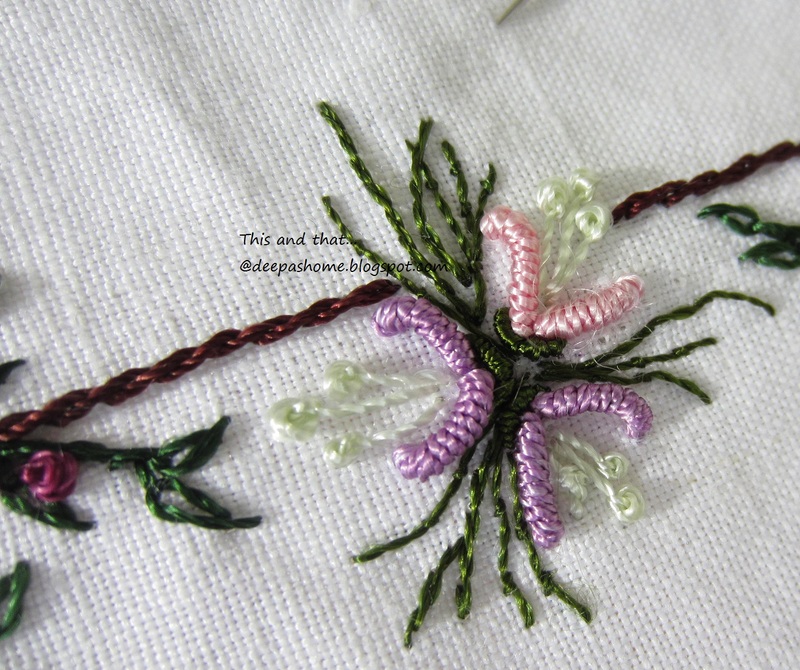 I'll post the full view once I am finished with my remaining set of flowers. I have never done Brazilian work, but it looks so lovely in your closeup photos. Beautiful work! Lovely. 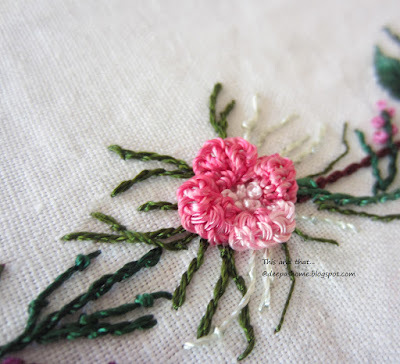 It will be a sampler of techniques as well as a beautiful piece! your stitching is beautiful as ever. Lovely! I can't wait to see the finished piece. Your Brazilian flowers look well done. Can't wait to see the finished runner! I'm so glad you decided to add more flowers and I especially like the pretty Maria's rose. Your work is exquisite! Looking forward to seeing the whole design. I love to look at Brazilian Embroidery, though I have never done it. Your stitching is amazing. 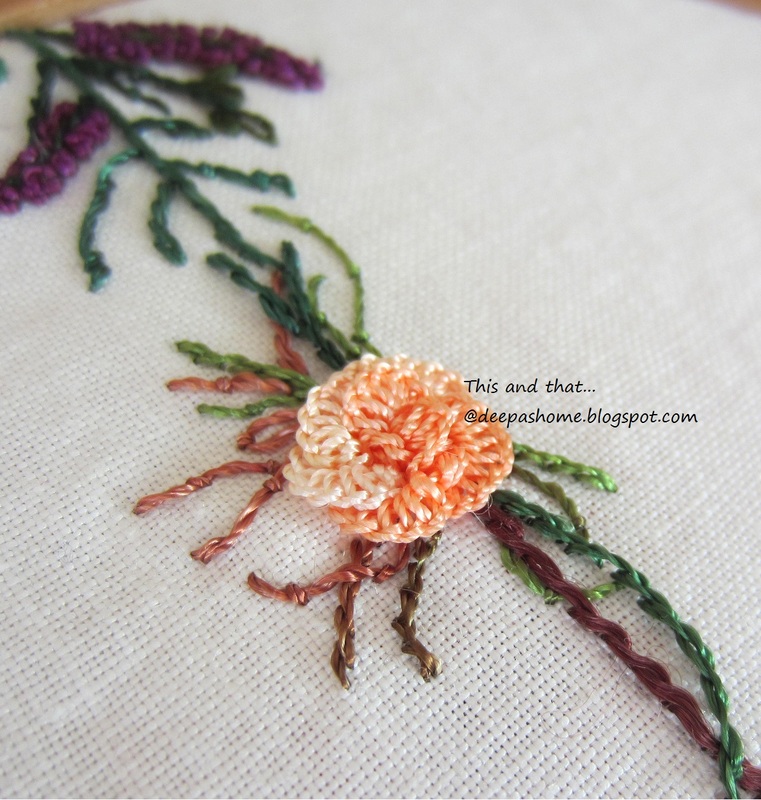 Creeping flowers, and rolled roses! Wow, it's all new to me, and soooo beautiful! I was searching for a tray cloth I bought in a charity shop to send you a picture of its border, only I had lost track of it, funnily that was brown but nothing like yours.